Turkish Airlines has a massive route network. They fly to more destinations than any other airline but that doesn’t mean those connections are always the most convenient for the average traveler. With connecting flights departing around the clock, you may find yourself with an extended layover in Istanbul and in need of a place to rest your eyes in between flights. But lucky for us, Turkish Airlines does a good job of taking care of their long-haul passengers. 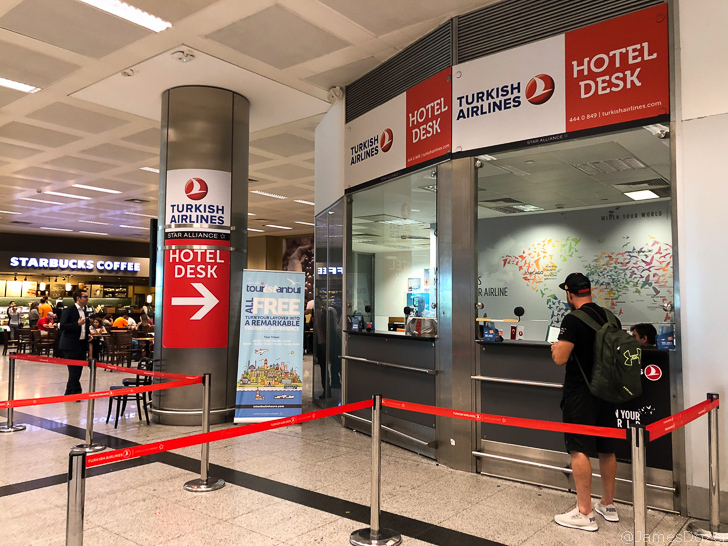 In addition to their massive two-story business class lounge, complete with day rooms and shower suites, Turkish Airlines also provides free hotel accommodations for passengers with extended layovers. That’s right, Turkish Airlines will provide you with a free hotel room if you have an extended layover in Istanbul. 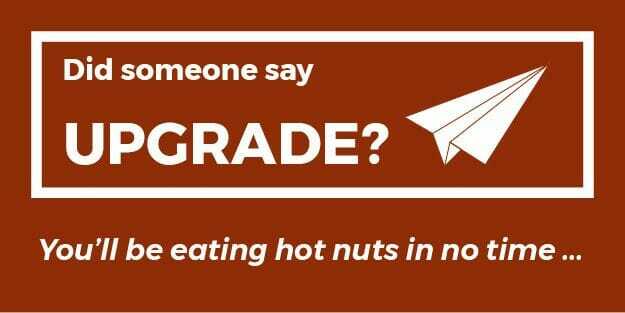 And it’s not just for business class passengers. Economy class passengers can get in on the deal, too. That’s it. There are only two simple rules. But the key is that the transit time must be a naturally occurring transit time and not a FORCED transit time; meaning, if you intentionally take an earlier flight or book a later flight in Istanbul or at your point of origin to force a longer layover, your extended travel time will not qualify for a free transit hotel. They are very strict about this so don’t try to game the system. I tried a couple of years ago and failed miserably. You can read more which connections qualify and which ones do not by clicking here. But on this trip, I was able to score a free hotel room and wanted to share some practical tips about the whole process. If you’re not sure if you will qualify for a free hotel room, you can always email them ahead of time to inquire. If you didn’t check ahead of time, you can always check upon arrival. Just follow the signs for international transfers and make your way to the Turkish Airlines Business Class Lounge. There, you can ask a lounge attendant to check for you before heading down to the Hotel Desk. 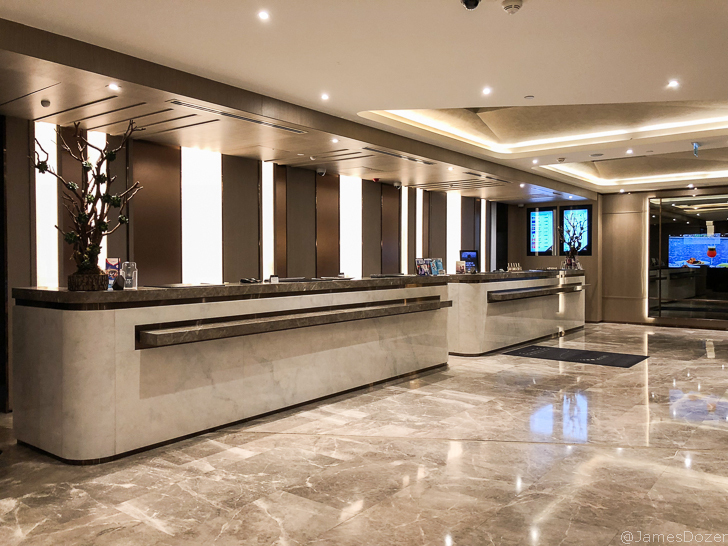 If you already know you qualify for a hotel room, just walk down to the Hotel Desk located outside the arrivals hall to process your request. But let’s look at some practicalities first. First and foremost, you need to get a travel visa for Turkey. All of Turkish Airlines’ contracted hotels are located outside the airport so, in order for you to leave the airport, you will need a travel visa. You can obtain a visa on arrival at the airport for $30 in CASH. Turkey no longer issues visas on arrival. You must get a travel visa beforehand. Here’s how. With your visa in hand, you can head towards the immigration checkpoint upon arrival. If you are traveling in business class, there is a dedicated business class priority lane just past the regular immigration lanes. Just keep walking about 100 feet for the expedited lanes on your left-hand side. From here, exit out the baggage claim area to the arrivals hall. Make a right outside the door and walk down about 150 feet. The Hotel Desk will be on your right-hand side, next to the Starbucks, and across from the Turkish Airlines Arrivals Lounge. The Hotel Desk also handles Turkish Airlines’ complimentary day tours. But note, you can only receive a free hotel stay or a free day tour per direction, not both. 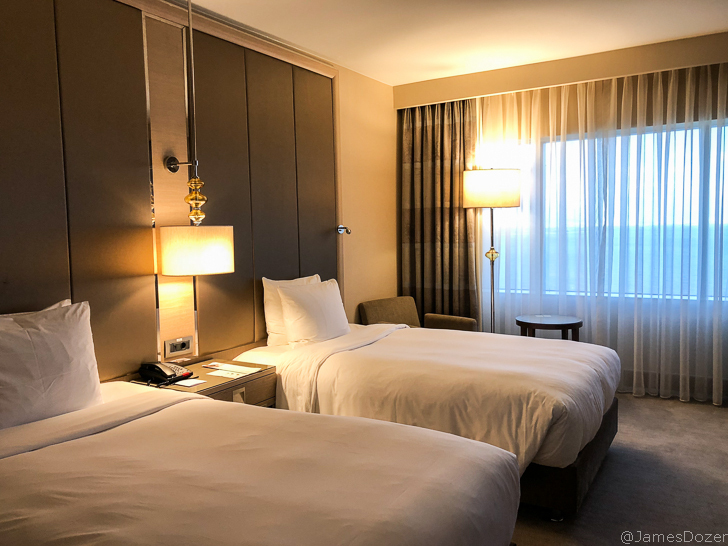 On this trip, I was provided a room at the Renaissance Polat Istanbul Hotel. After my information was verified, the driver escorted me from the hotel desk to the shuttle and drove me to the hotel located approximately 8 minutes away. He provided my documentation to the hotel staff and provided me with a pickup time. Everything was handled for me and I didn’t have to do anything. 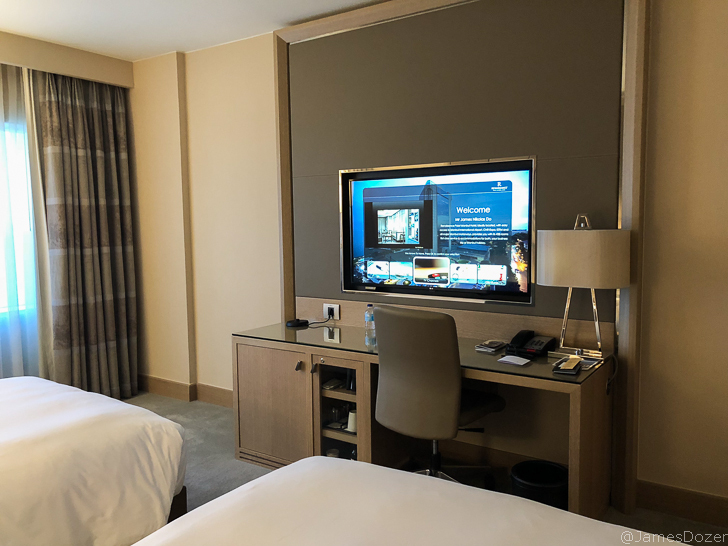 Note: For the Renaissance Polat Istanbul Hotel, you can give them your Marriott Rewards number for stay credits but you will not earn any Rewards Points. My room at the Renaissance was very nice. It had a great sea view, two very comfortable double beds and a work desk. The enclosed bathroom was spacious and perfect for washing away the long-haul travel grime. The hotel also featured an outdoor pool. In addition to the room, Turkish Airlines also provided me with a voucher for a free meal at the hotel restaurant. The voucher can be used for lunch or dinner, depending on the time of your stay. The meal was a fixed menu and it wasn’t bad. My dinnertime meal consisted of lentil soup, Mediterranean salad and chicken with rice. At your pre-arranged pickup time, just head downstairs and your driver will be waiting for you in the front. If you are traveling in business class, inform the driver and he will drop you off at the business class entrance of the international terminal. Once you clear through the initial security check, make a left-hand turn and head all the way down. There is a secret entrance to the lounge reserved specifically for business class passengers. You can clear immigration and security here and walk right into the lounge. You can also take this business class priority lane for expedited passport control and security clearance. Overall, this was a fantastic experience. The whole process was easy and convenient. From the moment I was picked up from the hotel, I was back at the airport, processed through two security checkpoints (one at the airport entrance and one post-immigration), cleared immigration, and was in the lounge within 23 minutes. I was well-rested and it was amazing as I didn’t have to coordinate anything. Good job Turkish Airlines! Have you guys taken advantage of Turkish Airlines’ free transit hotel? If so, please share your thoughts with us in the comments section below. Thanks for reading!